This dot to dot art challenge for kids is a great way to build concentration and fine motor skills while creating a beautiful artwork. 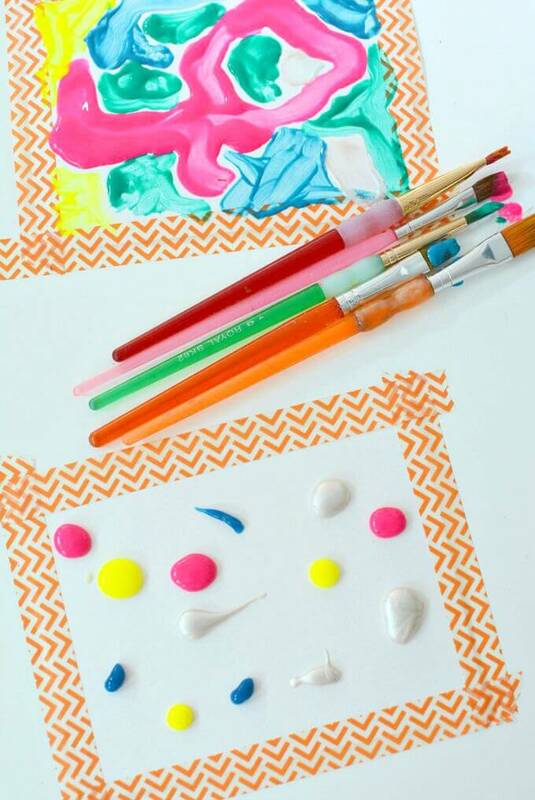 It’s also a fun way to prevent the kids paintings from becoming muddy and paint mixed. Post written by Meri Cherry. Did you ever do a painting with your child and before you knew it, it was one big brown moosh? Yup, I’m familiar with that too. The Dot to Dot Art Challenge is a great way for kids to build concentration and fine motor skills while creating something beautiful. 1. Tape your paper down with masking tape creating a border around each side. This will make the perfect frame when your painting dries. 2. An adult or child can squeeze about 20 drops of paint onto the paper. Now time for the challenge. The artists job is to cover the entire paper with color without letting any two colors mix. In other words, blue can’t touch red and red can’t touch yellow. They can get really close but only the same colors or dots are allowed to touch. We said only the same colors can kiss because they love each other so much. I demonstrated the challenge on my own paper before the kids got started. I showed them how the pink traveled slowly all over the paper to kiss all the pink dots and sometimes it had to jump over a bridge ( a line of a different color) to get to another pink dot. When these 4 year olds got working you could here a pin drop. The concentration was intense with the occasional kissing sound as pink touched pink and blue touched blue. 3. When all the white is covered on your paper you can peel the painters tape off the sides of the paper to create your frame. Set it aside to dry. You can also peel it after your paint is dry. These kids were pretty anxious to peel that tape and see their frame. It’s always very satisfying to see that perfect frame. Very profesh. *Note* If your paper is too thin the tape may rip as you pull it off, therefore I recommend using a nice watercolor paper that can hold under the tape without peeling or ripping. That’s how we did our Dot to Dot Art Challenge. This was such a success I tried it with different age groups on canvas with neon acrylic paints. It worked really well and was so interesting to see the difference between the 2’s, 3’s and 4’s work. The process and results were pretty fantastic. If you like this idea you might also like these family portraits that are great for the same age group. Meri Cherry, yes, that’s her real name, is an arts and crafts blogger at mericherry.com. She lives in Los Angeles with her husband and two young daughters. Meri is an art teacher and designer of art spaces for kids. She is passionate about the process of art, thrift stores, and the Reggio approach to learning. Meri Cherry, yes, that’s her real name, is an arts and crafts blogger at mericherry.com. She lives in Los Angeles with her husband and two young daughters. Meri is an art teacher and designer of art spaces for kids. She is passionate about the process of art, thrift stores, and the Reggio approach to learning. Hi Jean, I just wanted to thank you so much for such an amazing website! I took a summer job and the city parks & rec teaching LITTLES, which was a bit outside my comfort zone as my girls are now in their twenties!) I taught Silly Science & a Messy Art classes where I had to come up with my own lessons. Once I stumbled upon your website and subscribed, you have been my main inspiration. Thanks to the activities listed on your blog, my classes have been very well-received by parents and loved by the kids. Thank you for all that you do to share your ideas with the rest of us! What a great art project to work on focus and attention! I love the simplicity of and the abstract fun results!! Wish my child was younger I’d be at one of her play groups in a minute! Thanks so much Crystal! So glad you like this activity. It’s really fun and does a great job in slowing kids down. I love this idea and many others, but I would def. not tell the children that only the “same colors can kiss”…though I understand the context I feel it gives a very strong, unnecessary msg. Thanks for all the great art ideas for kiddos! Great ! Today we tried your dot-to-dot art challenge (2year old twins). Wonderful! So glad you enjoyed it, Alex!